Synthesizers and Royal Weddings were everywhere in the early Eighties, but the real Rolls Royce of electronic music was the Fairlight. An Australian-made music production system based on the Motorola 6800 processor, the Fairlight was - at well over £20,000 – a stupendously pricey piece of kit. 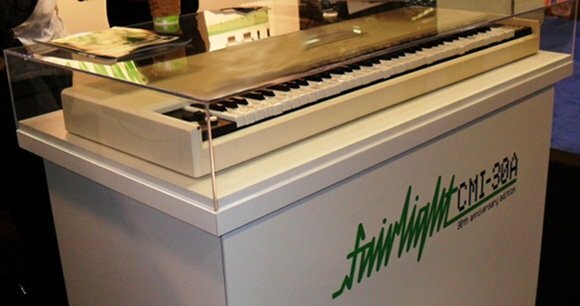 Officially named the Fairlight Computer Musical Instrument, the Fairlight was a pioneering digital music workstation. It was designed by Peter Vogel and Kim Ryrie, and imported into the UK by Syco – a high-end music (and later video) equipment retailer run by Peter Gabriel’s then brother-in-law, Stephen Paine. The Fairlight marked the practical beginning of digital samplers in music. The other ‘big ticket’ digital music production system of the era, New England Digital’s even pricier Synclavier, soon added sampling to its wavetable-based vocabulary. The early Eighties were, in a sense, the high water mark for big technology in music. Not because the charts were particularly dominated by high tech: Shakin' Stevens’s unapologetically retro Green Door was at number one in July ’81 and although Depeche Mode and The Human League were certainly bouncing around in the hit parade, they used comparatively low-end gear. In their early years Depeche Mode tended to use the new wave of entry-level synthesizers that were just coming onto the market, typified by the basic but meaty-sounding Moog Rogue. The Human League mainly used Roland modular systems from the mid-70s, controlled by Roland’s notoriously hard-to-master sequencers the MC-4 and MC-8. The Fairlight was an entirely different beast. It was launched in Australia in 1979 but first really excited the popular imagination after a 1982 South Bank Show special, which followed the recording of Peter Gabriel’s fourth and final self-titled album which our American friends know as Security. Other pioneers of the big beige monster included Kate Bush, who first used one on her 1980 Never For Ever album. The single Babooshka displays to great effect the Fairlight’s signature ‘glass breaking’ samples. The Fairlight sampled in mono, with a fairly grainy sounding 8 bit resolution and had a bandwidth of around 2100 Hz to 30 kHz. If there’s a mobile phone in your pocket right now, chances are that it can sample better than that. Sampling is now so ubiquitous that we forget how, back when Charles and Di were pledging their everlasting troth, it was a quite amazing trick. Just crudely playing a tune with a sampled dog bark (Wonderdog) was enough to kickstart the dastardly Simon Cowell’s musical career in 1982. By contrast, Gabriel used the Fairlight to evoke exotic ‘world music’ textures and generate skittery sequenced percussion for his ambitious and still very listenable fourth album. The Mark 2 version that Peter Gabriel would have used on tracks such as Shock The Monkey boasted 64 kilobytes of system memory. There was no hard disk. The operating system was loaded on a floppy disk that really was floppy, a big 8” square vinyl job that you could almost bend in half. A second drive enabled the user to load pre-made samples into RAM. The charts of the early Eighties were filled with the CMI’s ‘ORCH 5’ orchestra stab and breathy ‘ARR 1’ choir. The Fairlight was much more than just a magic box for playing back animal noises and violin screeches. There was a complex and powerful music composition environment (MCL) that no one I ever met really understood, a fully featured performance capture sequencer (called Page S) and a waveform analysis tool on which the user could modify an audio waveform directly onscreen using the attached light-pen. The big sell, though, was Page R. It was in effect a giant drum machine. Short ‘patterns’ of eight monophonic samples could be assembled quickly and easily into songs. If you wanted to use a Fairlight in tandem with, for example, a then-ubiquitous Roger Linn drum machine, there was no plug and play synchronisation. A dedicated studio clock called an SRC had to be pressed into service in order to get all of the devices of the era to talk to one another.